Visitors to Freeport, Maine today can enjoy a dinner at the historic Jameson Tavern located on Main Street. It was in the northeast room of this tavern on a March day in 1820 that the papers that separated Maine from Massachusetts were signed. The building remained a popular tavern in town until it was purchased by Charles Cushing, a well-known Freeport shipbuilder, in the late 1840s. Charles and his wife Martha converted the tavern into a single family dwelling and would go on to raise ten children in the house. Their second born son Charles A. would find success in shoe manufacturing in nearby Portland, Maine before making the cross country trip to Seattle where he is now buried in Evergreen Washelli Cemetery. Charles A. Cushing was born on Feb. 7, 1850 in Freeport, Maine. He remained under his parent’s roof until his mid-20s when he moved to Portland, Maine. It was here that he met and married Hattie Sawyer sometime in the early 1870s. The couple welcomed their first son, Charles E., in 1874. Charles formed a business partnership with James Webb around 1882 and opened the Webb & Cushing Shoe Factory. A business card indicates the company focused on the manufacturing of ladies & misses fine boots and shoes. The partnership lasted for over ten years. In 1893, Charles suffered tragedy when his wife Hattie passed away after a battle with spinal meningitis. She was only 43 years when she passed away. 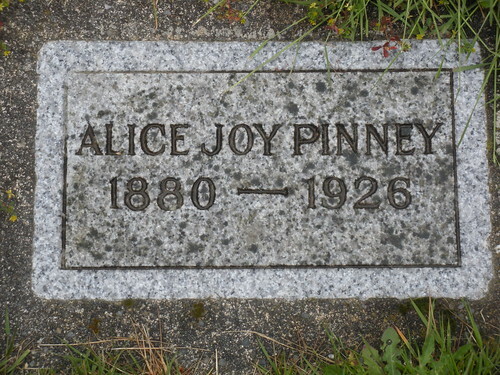 She was buried in Evergreen Cemetery in Portland, Maine. It appears that around the same time as his wife death’s, his business partnership with Webb dissolved and he moved his shoe business back to Freeport, Maine. On March 17, 1895, Henry Blanchard joined Charles and Helen G. Chenery in marriage in Deering, Maine. Helen had also been widowed at a young age and brought with her one son, John G., from her first marriage. In 1899, Charles invested in a new railroad being built in Port Angeles, Washington. Financed by investors based in Boston, Charles moved his family including his son Charles and his young wife Leonice, across the country to the small town on the peninsula of Washignton State in late 1899. The new railroad, Port Angeles Eastern Railroad, appears to have run into several problems and newspaper articles from the time report on the start of construction several times between 1900 and 1904. In June 1903, Charles was preparing for a visit from several other railroad officials. The group had planned to go hunting so he took time prior to the visit to clean his shot gun. The gun accidentally discharged hitting Charles in the abdomen. A physician was called and quickly administered aid. The newspaper account reported the wound to be ‘a hole large enough to insert one’s hand. A part of the intestine had been shot away, however, no vital organs had been injured’. No further reports of the accident was found so how debilitating his injury were is unknown. In October 1904, the railroad was sold to the American-British Finance Company. It appears that Charles cut ties with the project around this time, however the reason for his departure is unknown. By 1906, Charles and Helen had moved to Seattle. Around this same time, Charles began a career in the hotel industry. Over the next nine years, he would manage several Seattle hotels including The Fairfield, The Knickerbocker, Wintonia, and The Stander. 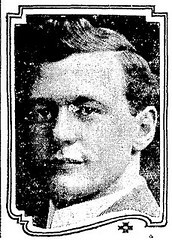 In January 1915, Charles had surgery at Seattle General Hospital. The exact surgery could not be discovered. He developed complications following surgery. On January 7, he passed away. He was laid to rest at Evergreen Washelli Cemetery. 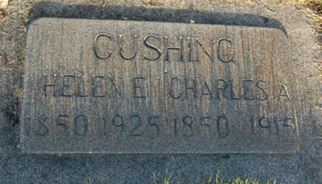 Birth Record of Charles A. Cushing. Feb. 07, 1850 Source: “Maine, Births and Christenings, 1739-1900,” index, FamilySearch (https://familysearch.org/pal:/MM9.1.1/F4C3-8H3 : accessed 5 January 2015), Charles A. Cushing, 07 Feb 1850; citing FREEPORT,CUMBERLAND,MAINE; FHL microfilm 10,917. 1886 Portland, Maine. Sheet 9. Joseph Otto was born on June 29, 1893 in Italy. He came to the United States in May 1909. When he applied for citizenship in 1918, he listed his place of residence as Camp Lewis and occupation soldier. According to his military service records, he served overseas from July 16, 1918 to April 14, 1919 and was discharged on May 2, 1919. Sometime between his discharge and 1922, Joseph married Fannie Colasurdi (born December 28, 1899). The couple was not found on the 1920 census or in Seattle city directories for 1919-1921. No marriage record was located in King County. One theory I have is that Joseph returned to Italy, married Fannie, and brought her back to Seattle. By 1922, they found a home at 1830 Weller Street. Joseph found work as a laborer for Seattle water department. He would hold this job for the span of his career. Sadly, on October 11, 1928 Fannie passed away at the young age of 29. No obituary could be found. No birth records or death records could be found for an infant Otto. It is unknown how Mrs. Otto perished. Joseph never remarried and lived in the couple’s home until August 30, 1953 when was reunited with Fannie. 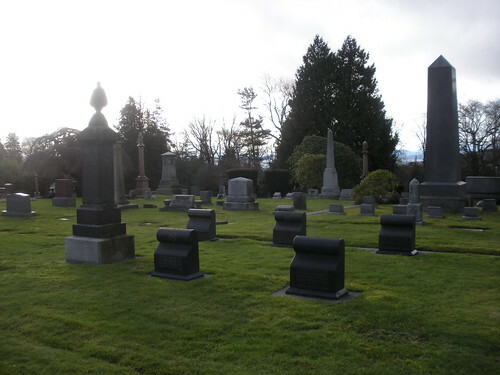 The couple is buried at Calvary Cemetery in Seattle. 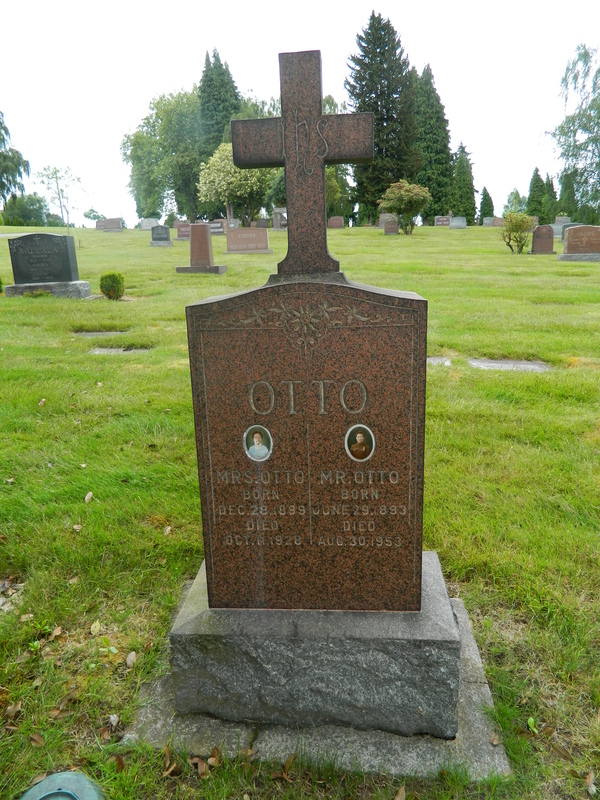 The fact the couple is listed Mr. and Mrs. Otto on their headstone emphasizes to me the strong love the two had for one another making their story so sad and tragic. U.S., Naturalization Records – Original Documents, 1795-1972 (World Archives Project). Ancestry.com. U.S., World War I Draft Registration Cards, 1917-1918. Ancestry.com. Year: 1940; Census Place: Seattle, King, Washington; Roll: T627_4382; Page: 1B; Enumeration District: 40-276. Year: 1930; Census Place: Seattle, King, Washington; Roll: 2500; Page: 1B; Enumeration District: 175; Image: 903.0; FHL microfilm: 2342234. G.P. Scherrer 1st came Chicago ILL when he was 12 years old. Had a twin brother name Jacob who had a boy & girl – Granite City, ILL. I was intrigued by this photo and the amount of detail transcribed. I purchased it for $1. It had sat in my conference notebook until this morning when I decided to do a little research on the Scherrer family. Here is what I uncovered. No immigration records were found for George Scherrer. He first appears in the 1880 U.S. Federal Census in Lincoln, Lancaster, Nebraska working as a carpenter. No records could be found to verify that he went to Chicago first. If as the photo details, he immigrated at age 12, he would have come to the U.S. in the early 1860s. Further research will need to be done to determine if there are any records to put George in Chicago in the 1860s. On November 12, 1883 George married Augusta Krone, daughter of H.W. Krone and Louisa Seivers, in Lincoln. On October 25, 1884 the couple welcomed daughter Louise. In the 1885 Nebraska State Census, the family is found in Lincoln. George is listed as a butcher. Living with them is Augusta’s mother Louisa and a 27 year old woman name L. Hart who is listed as a sister. It is not known if this was a sister of George or of Augusta. On September 25, 1886 George Jr. is welcomed into the family. Sometime after the birth of George Jr. the family left Lincoln and settled in Butte, Montana. The earliest city directory that could be found in Butte was 1899 where George is listed as a butcher living at 348 East Granite. By the 1904 city directory, the family had moved to 216 W. Gelena. They would reside in this house until George and Augusta moved to Washington State. The exact date of the move is unknown. The last Butte city directory that the couple appear is 1911. The back of the photo seems to indicate that George Jr. moved to Colfax in 1912 but does not list any source for that information. On April 18, 1914 George Sr. passed away at the age of 62 in Colfax, Whitman Washington. Augusta is found living with George Jr.’s family in the 1920 and 1930 census in Spokane, Washington. On November 2, 1937 Augusta passed away at the age of 77. Her death record lists her father as Frederick which is different than what is listed on her marriage record. Their daughter Louise is not found in 1920 and 1930 census with the rest of Scherrer family. She passed away in July 1976 in Spokane. It is unknown when she arrived in the city. Death information for George Jr. and his wife Emma could not be located. They did have at least two sons. Their first son, Frederick George was born on Nov. 5, 1914 and on September 11, 1918 Robert Hamet was born. I would love to know how this photo ended up in a antique shop in Port Angeles. Did George Jr. or Louise or their descendants move to the Port Angeles from eastern Washington? Did the antique dealer pick up an estate sale in his travels or on Ebay? I would love to return this photo to any descendants of this couple out. If you or someone you know has this family in your tree, please send me an email and I would be happy to mail this photo to you. “Nebraska, Marriages, 1855-1995,” index, FamilySearch (https://familysearch.org/pal:/MM9.1.1/X5ZF-9BG : accessed 23 Sep 2012), George Scherrer and Augusta Krone, 12 Nov 1883. Year: 1880; Census Place: Lincoln, Lancaster, Nebraska; Roll: 751; Family History Film: 1254751; Page: 136D; Enumeration District: 229; Image: 0457.Year: 1900; Census Place: Butte Ward 3, Silver Bow, Montana; Roll: 914; Page: 2A; Enumeration District: 107; FHL microfilm: 1240914. Year: 1910; Census Place: Butte Ward 6, Silver Bow, Montana; Roll: T624_836; Page: 6A; Enumeration District: 0108; Image: 882; FHL microfilm: 1374849. Year: 1920; Census Place: Spokane, Spokane, Washington; Roll: T625_1940; Page: 1B; Enumeration District: 160; Image: 875. Year: 1930; Census Place: Spokane, Spokane, Washington; Roll: 2518; Page: 13B; Enumeration District: 95; Image: 310.0; FHL microfilm: 2342252. Butte, Montana City Directories 1899-1911 Ancestry.com. U.S. City Directories, 1821-1989 (Beta) [database on-line]. Provo, UT, USA: Ancestry.com Operations, Inc., 2011. August Sacherrer Death Record. Ancestry.com. Washington, Deaths, 1883-1960 [database on-line]. Provo, UT, USA: Ancestry.com Operations Inc, 2008. Ancestry.com. Washington, Births, 1883-1935 [database on-line]. Provo, UT, USA: Ancestry.com Operations Inc, 2010. 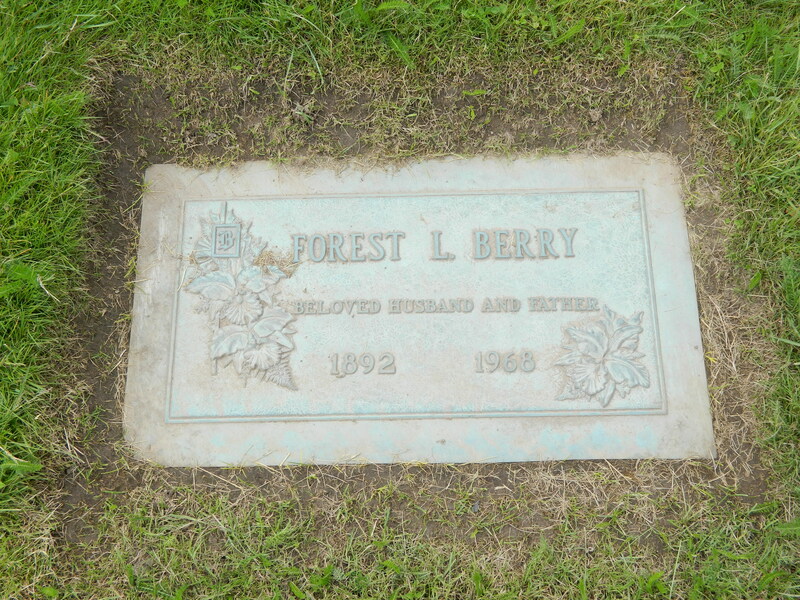 Forest Lyman Berry was born on March 18, 1892 to John and Martha Berry in Sedalia, Missouri. He joined older sisters Iva and Audrey and an older brother Harley. 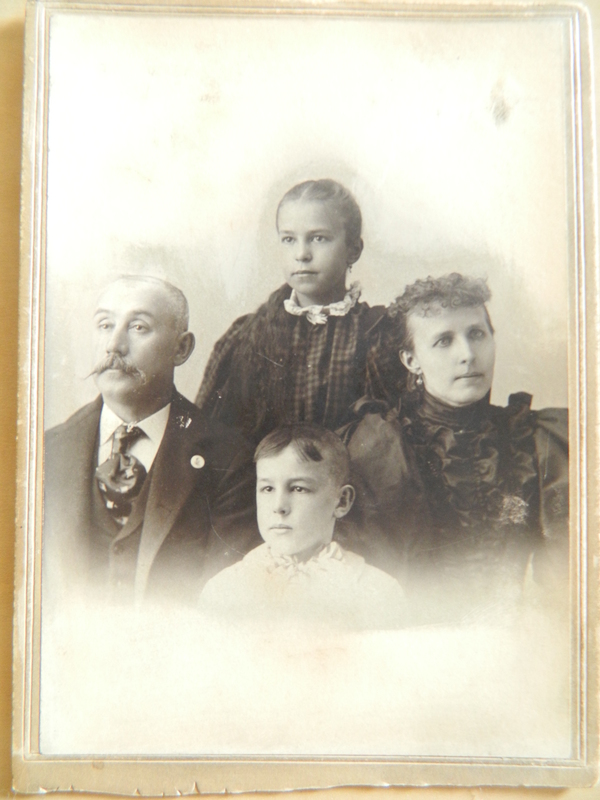 The growing family is found in the 1900 U.S. Census still living in Sedalia. A younger sister Lora joined the family around 1893. By the 1910 census, Iva had moved out of the house but the rest of the children were still living with John and Martha. Forest’s older sister Audrey’s husband Albert Lacky was living with the family as well. On October 14, 1912, Forest married Elsie F. Smith. According to the marriage certificate, Elsie was under 18 at the time of the wedding but her father G. A. Smith gave his consent. 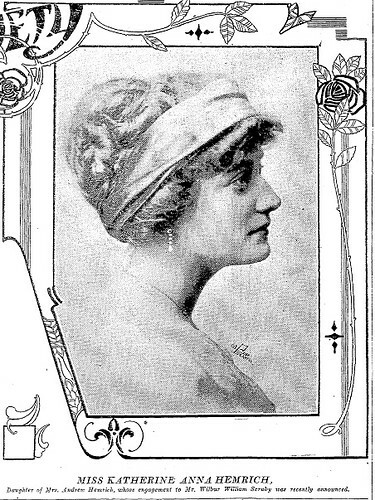 Their first daughter, Evelyn, was born between 1913-1914. A second daughter, Cecil, was born between 1915-1916. By 1918, he had found work with the Missouri, Kansas, and Texas Railway as a fireman on Locomotive23. The family is found still living with Forest’s mother and father in the 1920 census. The family moved from Sedalia to Seattle sometime before the 1930 census. In this census, Forest is no longer working for the railroad but is working as a laborer for a poultry house. He changed careers again by the time of the World War II draft in 1942 when he is listed as working for the Seattle Tacoma Shipbuilding Corporation. 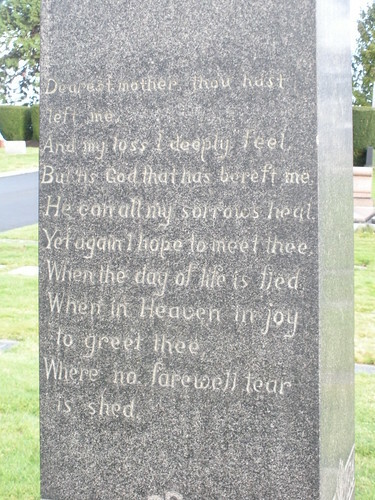 Forest passed away on July 7, 1968 in Puyallup, Washington and is buried at Bonney-Watson in Seatac, Washington. Forest’s wife Elsie passed away two years and was laid to rest next to Forest in Bonney-Watson. I was honored to be featured on the Graveyard Rabbit’s blog this week. Thank you Sheri for spotlighting my blog. Welcome everyone who found this blog through the Graveyard Rabbit’s site. I hope you enjoy my blog! 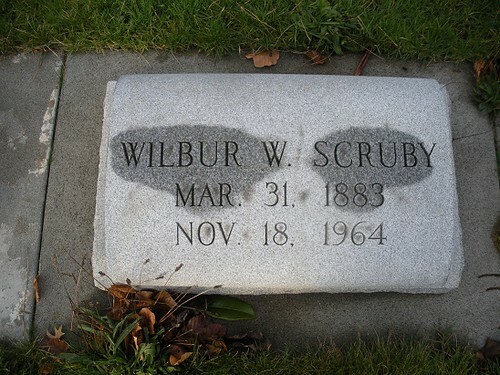 Wilbur William Scruby was born on March 31, 1883 in Wheeling, Livingston, Missouri to Frank Scruby and Anna Belle Fenstermacher. He was the middle child of three children. He had an older sister, Nina Bella and a younger brother Charles A. The family moved to Chillicothe, Missouri where he spent his childhood. In 1901, Wilbur found work as clerk in the office of the auditor of the Chicago, Burlington & Quincy Railroad in St. Joseph, Missouri. In 1903 he entered a career in banking at the National Bank of Commerce in Kansas City. Only a year later in April 1904, Wilbur moved to Seattle and found a job in the officer of the city treasurer, S.F. Rathbun. Wilbur’s brother moved to Seattle in 1908 and both found positions with the Washington Trust Co. When the Washington Trust Co. was absorbed by the Dexter Horton National Banks the brother continued their careers. In the 1910 census, the brothers are found living as boarders in the house of Charles A. Thorndike. In 1912, he married Katherine Hemrich, the daughter of Andrew and Amelia Hemrich. Wilbur and Katherine welcomed their first child on April 2, 1915 when Amelia Katherine is born. In December 1918, Wilbur was promoted to assistant cashier. The picture on the left is from the announcement of the promotion featured in Seattle Times on Monday, December 2, 1918. Later that month, Wilbur’s second daughter, Annabella was born. The young family is found in the 1920 census living at 3907 McCellen Street. Also living with the family is Katherine’s widow mother, Amelia. That same year, Wilbur received a promotion to cashier at Dexter Horton and Charles Scruby leaves Seattle and settles in Los Angeles, California. Wilbur Jr. is born on January 22, 1924. Wilbur received another promotion at Dexter Horton in 1927 when he is elected vice president. He continued this position when Dexter Horton and other banks are consolidated into Seattle First National Bank in 1929. His position with Dexter Horton allowed his family to take vacations and socialize with the affluent social circle. The Seattle Times calls his wife Katherine ‘one of Seattle’s most popular society matrons’ and details the many afternoon teas, lunches, and other social events hosted by the couple. In May 1930, Wilbur took his wife and daughter Amelia for a 1 month trip to New York. That same year we find the family in the federal census residing in the family home at 3907 McCellen Street. Living in the house with the family is Jane Craigen, their private servant. Wilbur’s mother-in-law is no longer living in the house with the family but has moved in next door. His daughter Amelia was the talk of the town when she married Edward M. Argersinger in a lavish fall wedding. Wilbur faced tragedy in 1938 when his only son Wilbur Jr. passed away at the age of 15 after being admitted to the hospital with a streptocci infection. In 1939, the family enjoyed a 3 week vacation to Alaska where they stayed on a dude ranch just outside Wrangell, Alaska. Another tragedy was faced by the family in May 1944 when Wilbur’s daughter Amelia lost her twin infant daughters to atropine poising only two months after being born. In 1947, Wilbur was named an honorary state senator for his 32 years of work as a lobbyist for the State Banking Association. A year later, he retired as vice president of the Seattle First National Bank after 40 years. In March 1950, Wilbur and his wife paid a visit to his brother in California where all three were involved in a head on collision. Wilbur suffered two broken ribs and his wife sustained severe cuts. Only 4 months later, Charles Scruby passed away in Hollywood, California. It is unknown if this was from injuries sustained in the car accident or from other causes. Not much of Wilbur’s later life is documented. On November 18, 1964 he passed away at the age of 81 in a Seattle hospital. In his obituary, it noted that in addition to his career at First National, he was also “a director and vice president of the Marion Realty Co. here and of C.E. Blackwell & Co. Okanogan ; a director and treasurer of Lawyers Title Insurance Corp., Seattle and a director of the First Realty Corp., Seattle. He was past president of the Rainer Club and treasurer-emeritus of the Nile Temple of the Shrine.” He left behind his wife Katherine, his two daughters Annabelle Crandall and Amelia Argersinger, his sister Nina, eight grandchildren, and three great grandchildren. He is buried in Lake View Cemetery in his wife’s family plot. United States Federal Census. Year: 1900; Census Place: Chillicothe Ward 2, Livingston, Missouri; Roll: T623_872; Page: 11A; Enumeration District: 93. United States Federal Census. Year: 1910; Census Place: Seattle Ward 7, King, Washington; Roll: T624_1661; Page: 9A; Enumeration District: 0144; Image: 124; FHL Number: 1375674. United States Federal Census. Year: 1920;Census Place: Seattle, King, Washington; Roll: T625_1930; Page: 12A; Enumeration District: 297; Image: 409. United States Federal Census. Year: 1930; Census Place: Seattle, King, Washington; Roll: 2502; Page: 44A; Enumeration District: 193; Image: 754.0. World War I Registration Card. Registration Location: King County, Washington; Roll: 1991930; Draft Board: 10. Seattle Daily Times. ‘W.W. Scruby’s Son, 14, Dies in Hospital’ November 10, 1938. Alice Clarissa Joy was born on December 13, 1879 in Springsport, Jackson, Michigan to Ben A. Joy and Clarissa Ferris. She was the youngest child in a family of 4 girls. Alice followed in her oldest sister M. Grace’s footsteps and went to Albion College. After graduating from Albion in 1898, she continued her studies by completing a post graduate study at the state university in Ann Arbor, Michigan. She earned a Masters of Arts in June 1900. She married Henry Louis Pinney on September 9, 1902 and the couple settled in Cass City, Michigan. By 1910, the pair had moved to Seattle, Washington. The 1910 United States Federal Census shows the couple living at 1910 Alder Street in Seattle with their young daughter Gertrude. Gertrude was born on March 10, 1909 and was the couple’s second daughter. Their first daughter arrived on April 9, 1908 stillborn. 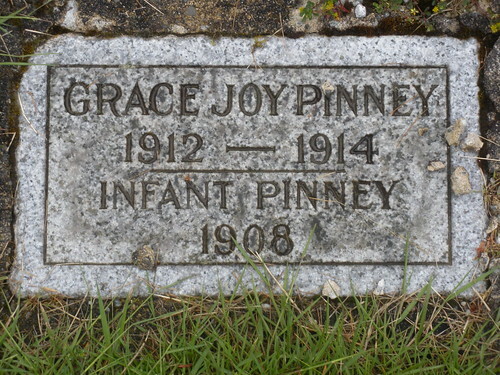 Their third daughter, Grace Joy, was born on September 12, 1912. In Febuary 1914, Grace came down with whopping cough and died shortly there after. Later that same year, Alice gave birth to Doris Hope on November 4. Their only son, Edmund Joy, was born on August 19, 1917. Their sixth and final child, Barbara was welcomed on August 2, 1919. In the 1920 United States federal census, the family is found living at 1430 35th Ave at Seattle. Alice’s life was cut short when she passed away on Christmas Eve 1926 at the age of 46. She was laid to rest in Mount Pleasant Cemetery next to her daughters who preceeded her in death. Ancestry.com. Washington Births, 1891-1907 [database on-line]. Provo, UT, USA: Ancestry.com Operations Inc, 2010. 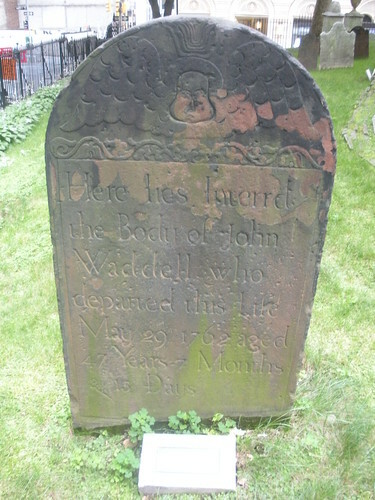 John Waddell was born October 3, 1714 in Dover, England. Details on his immigration to the United States are not known but according to marriage records he married Anne Kirton on Nov. 30, 1736 in the chapel in Fort George, New York. This was located at the southern tip of Manhattan. Anne was the daughter of Ann Hony and William Kirten. Between the years of 1737 and 1738, Waddell was enrolled as part of Capt. Van Horne’s foot company militia. After this time, Waddell became a merchant and spent his time sailing between London and New York City. Newspaper records showed he sailed ships by the names of Oswego and Dover. The Dover is ‘said to have been built at the foot of that street in New York, this occasion given rise to the name of that street’ (Jordan, 800). John and his wife had 7 children. William -July 16, 1737 – ? During his lifetime, he was a warden to the port of New York, a founding member of St. Andrew’s Society of New York, and a orginal subscriber to the New York Society Library. He died prior to the library’s establishment but his wife stepped in his place and her name appears on the document of incorporation by George III. John died in New York City on May 29, 1762 and is buried in the Trinity Churchyard in Manhattan. The New York Historical Society has a painting of John and Anne Waddell in their collection. Jordan, John W. 1978. Colonial and revolutionary families of Pennsylvania: genealogical and personal memoirs. Baltimore: Genealogical Pub. Co.
Lucinda Haun married Joseph England when she was around 16 years old in 1867. By the age of 19, she is found in the 1870 census with her husband and two young boys. Elijah is 2 years old and Isaac Newton was born in Janauary of that year. Isaac loses his mother Lucinda at early age. By 1880, Joseph is listed as a widow and has a household of 4 boys: Fred (age 11), Newton (age 10), Ruben (age 7), and Harry (age 3). From the age of Harry, we can guess that Lucinda passed away between 1877 and 1880. She is not found in the 1880 mortality census. Isaac marries a woman by the name of Sarah. Her maiden name was not located. The couple has 4 children, 3 who survive infancy. Gladys is born in August 1894, Gertrude is born in August 1895, and Joseph Newton was born in July 1898. 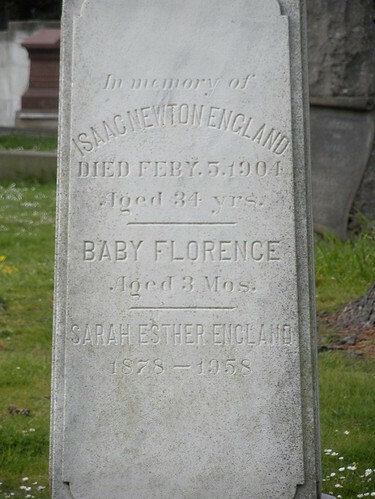 Given the span between Gertrude and Joseph, it is believed that the child listed on their headstone Florence was born sometime between 1896 and 1898. No records were found for baby Florence. Isaac was a housekeeper at a rooming house at 1009 Powell Street in San Franscico. On the 1900 census, he is living with his wife and children at this location. At the age of 34, Isaac passes away and leaves behind his family. He is buried in Holy Cross Cemetery in Colma, Calfornia. 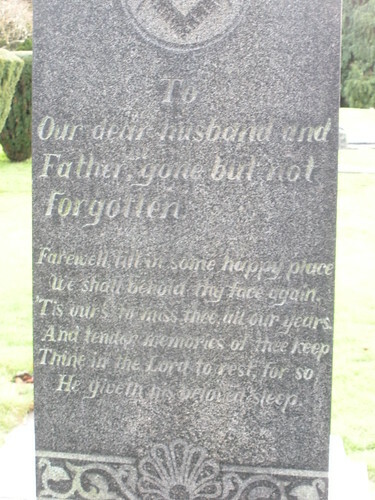 Sarah Esther England, his wife, passed away in 1958 and is buried with her husband and infant daughter Florence. 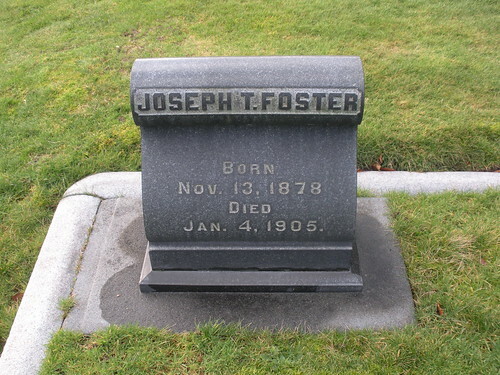 Joseph Foster was born April 10, 1828 in Ontario, Canada to Rev. Thomas Foster and Rosetta Laska. He appears to have been the oldest of six children. His father was born in England and his mother was born in New Brunswick, Canada. One of his biographies recalled that “He was found of music and traded a rifle for a violin, but his father made him dispose of that instrument of the devil and he never learned to play” (The Seattle Times. June 17, 1948. Page 16). The Foster family moved to Geauga County, Ohio when Joseph was a young child. At the age of 14, he began an apprenticeship as a tailor. He became a journeyman and worked as a tailor for 12 years. In early 1852, Joseph and his brother Stephen decided to go west. They crossed by ox-cart and completed much of the trip on foot. They reached the West Coast by July of 1852. Some accounts have them arriving in Portland, Oregon while others put the brothers in Vancouver, Washington. They arrived in good health but with little finances. The brothers soon found work. Joseph found work on small flatboats that were moving freight from the mouth of the Columbia upstream. Stephen found work as a bricklayer, an occupation he held back east. After securing some finances, the brothers were on the move again and found themselves in Oregon City. They worked in the gold mines for a time before moving south again to try their luck in the gold fields of Shasta City, California. When funds dried up, the brothers were hired to do farm labor on the Sutter Farm despite a complete lack of agriculture experience. Newspaper accounts report that the brothers did so well that at the end of the season fellow farm laborers and the owner of the farm were shocked to learn that the brothers had lied about their background. Their next move took them to San Francisco. “They purchased tickets for the trans-Pacific crossing to Australia but as the last moment Stephen changed his mind and Joseph wouldn’t go without him. They managed to sell their tickets and arranged instead for passage on the brig ‘Carib’ sailing to Puget Sound. (Spencer & Pollard, 500). In April 1853, the brothers arrived on Alki Point and were taken ashore by C.C. Terry. They took up land claims at the forks of the White and Black rivers. “They cleared and logged, selling their logs to Yesler’s mill.”(Seattle Times. June 17, 1948, pg. 16). One biography claimed that Joseph Foster was part of a group of men that took the first log into Yesler’s mill. In 1854, Joseph made the first tailored suit in Seattle when he made a wedding outfit for John Thomas. The suit was made in L.B. Wycoff’s blacksmith shop on First Avenue between Washington Street and Yesler Way. In 1855, Joseph enlisted in the Indian War at Fort Steilacoom under Lieutenant Nugent and served as a packer and scout. At the end of the conflict, Joseph returned home to find that his log house had been burned to the ground. This did not deter him and he soon rebuilt the house. At this point, Stephen’s whereabouts could not be determined. While Joseph is found in the 1857 territorial census, Stephen is nowhere to be found. In 1858, Joseph was elected to the Territorial Legislature in Olympia. He would be elected eleven times in his lifetime. He made his early trips to Olympia by canoe. In December 1860, he introduced a bill to build a military road from Seattle by way of Snoqualmie Pass to Colville. It became the first road over the mountains. Prior to 1861, the territorial legislature had pushed the idea of a territorial university with two locations. Joe introduced and got a bill passed in 1861 “locating a united, or single, university in Seattle” on the condition that the city would donate 10 acres to house the university. A donation from Arthur Denny, Charles C. Terry, and Edward Lander provided the land at the core of the business district of Seattle and the cornerstone for the university was laid in May 1861. In addition to these two milestones, Joseph was also known to be a fighter for women’s suffrage and was seen in high regard from both parties. One article even stated that he was offered the governorship of Washington which he denied for personal reasons. The Steele family took up the land across the river from Joseph Foster. The family included James and Jane, their daughters Martha and Susannah, Susannah’s husband Milton Robbins, and Susannah’s two young daughters from his first marriage, Jane and Ella Fenton. Joseph soon fell for Martha and he began “crossing the river so often that Martha’s father nailed the front gate shut” (The Seattle Times. June 17, 1948). This did not deter Joseph and the two were married in June 11, 1865. Their first son, Charles, was born in 1866 followed by a daughter, Rosetta, in 1868. A second daughter, Emily A., was born in 1873. Details from his biographies indicate that Joseph and Martha loved being parents. Despite the tragic loss of their three children, Joseph and Martha found a way to move on. In November 1878, Joseph Jr. was born followed by another son, Hillory Adams, in 1880. By the 1885 census, we find two of Joseph’s brothers and their families living near Joseph and Martha. Stephen is living with his wife Josephine and their 4 year old daughter Nora. Charles is living with his wife Matilda. By this time, the area became known as Foster, Washington in honor of Joseph and his family. 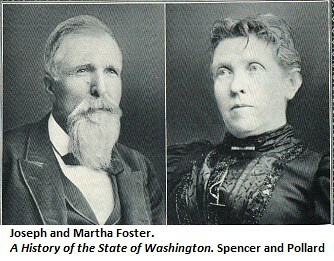 Joseph and Martha Foster enjoyed opening their house for dinner parties. Several newspaper articles were found in the Seattle Times that highlight the events at the Foster Mansion. Here is one example from July 26, 1902. 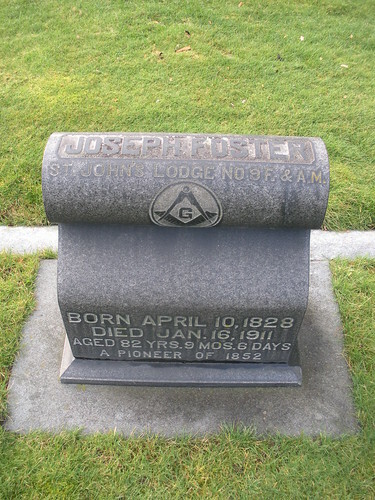 Another tragedy hit the family in January 1905 when Joseph Jr. passes away after an illness at his father’s house. On January 16, 1911 after fighting a cold “Uncle Joe”, a nickname many in the community knew him by, passed away at his home. He left an estate of around $500,000 including many business and residence lots in Seattle and Georgetown. He was buried several days later in Lake View Cemetery. His wife Martha passed away in 1924. 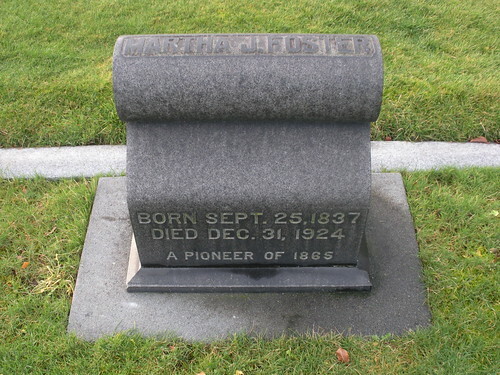 She is buried with her husband in the Foster plot at Lake View Cemetery. 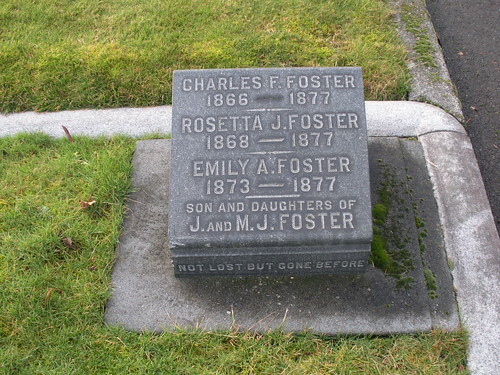 The area known as Foster is now part of Tukwilia, Washington. There is a Joseph Foster Memorial Park and a Foster Golf Course.